Obituaries from Sullivan newspapers, including the Sullivan Daily Times, Sullivan Democrat, and Sullivan Union, Sullivan County, Indiana. 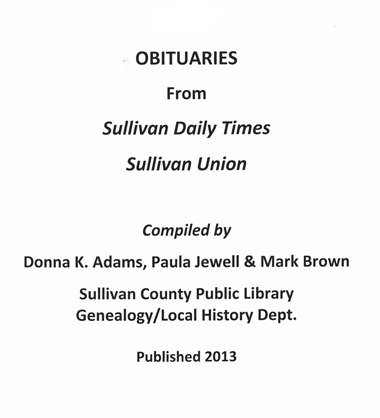 These records were compiled by Donna K. Adams, Paula Jewell, and Mark Brown of the Sullivan County Public Library Genealogy/Local History Department. They have been generously shared with The Genealogy Center of the Allen County Public Library and interested genealogists everywhere. NOTE: Not all years from 1900 to 2017 are included in this collection, nor is every newspaper included in every year. See the individual year for coverage.